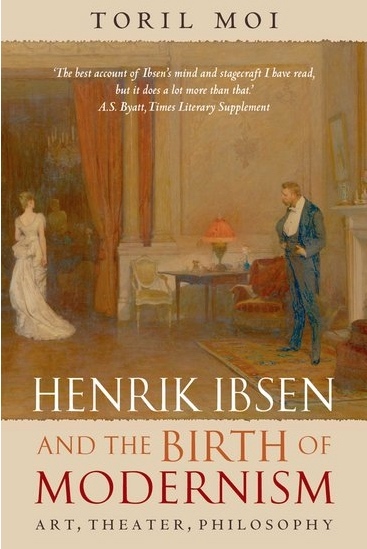 In Henrik Ibsen and the birth of modernism, Toril Moi proposes that Ibsen was the most important playwright since Shakespeare, and that his work was critical to the coming of modernism in the West. Last month, I was pleased to give a talk at the Centre for Ibsen Studies at the University of Oslo. I wanted to explore with the people there a theme of Søren Kierkegaard's Concluding unscientific postscript and the seeming opposite, Ibsen's plays about science. On the theme of science, Ibsen had written Ghosts, about the discovery of syphilis in a family. Following the shock provoked by that play, in 1882 he wrote An enemy of the people, about the discovery by Dr Stockmann that, in the town baths which were central to the economy of the town where he lived, the water was contaminated. Dr Stockmann thinks at first that his discovery will benefit the town. But the town's mayor, his brother, thinks otherwise, and the local people come to think of Dr Stockmann as their enemy. A huge concern of Ibsen's time was the spate of five cholera epidemics that swept through Europe in the nineteenth century, killing hundreds of thousands of people. In the 1850s, cholera was discovered to be spread by contaminated water, but it took years for the discovery to be accepted. It was, however, this discovery that enabled the inference that infectious diseases are spread by germs. Cholera and its implications caused great public consternation, and were discussed in newspapers much as AIDS was discussed in the 1980s, and cancer is discussed today. A source for An enemy of the people came from a friendship with the poet, Alfred Meissner, which Ibsen had formed in the 1870s when he was living in Munich. H.G. Kohler recounts how Meissner told Ibsen that his father, Dr Eduard Meissner, had worked in Teplitz, in Bohemia. In the middle of the summer of 1832, he had diagnosed a case of cholera. The mayor of the town tried to get him to change his diagnosis, but he refused. A mob besieged his house, smashed his windows, and demanded that he leave the town. In a two-faced way, the town's mayor professed friendship with Dr Meissner, but endorsed the crowd's demands, so Dr Meissner and his family were forced to leave the town. This conflict is replayed in An enemy of the people, with Dr Stockmann's diagnosis of contaminated water in the town's public baths. He becomes increasingly assertive, and is rejected by everyone in the town except his wife and children. The climax comes at the end when Dr Stockmann proclaims: "the strongest man in the world is the man who stands most alone." Science is based on evidence and is provisional. At the same time one can meet scientists who believe they are absolutely right, who confront every attempt to ask questions, or to offer suggestions, with vehemence. Søren Kierkegaard proposes the idea of indirect communication in a passage of some eight pages in Part Two of Concluding unscientific postscript. His idea is that indirect communication is a mode in which a person communicates with someone else not to persuade, not to try to get the other person to think as the person wants, not to coerce, but to enable the other to think and feel what she or she wants to think and feel. Kierkegaard links it to inwardness, which is fundamental to modernism in literature. One implication of the idea of indirect communication is that as audience members and readers of artistic fiction we are not instructed, not persuaded what to think and feel. Instead, we are invited to think and feel for ourselves in the circumstances of a play, short story, novel, or film. And rather than being unscientific, as Kierkegaard may seem to imply from the title of his book, the idea is also at the centre of science because although a scientist offers evidence, and suggests inferences from it, science is provisional. The scientist does not stand alone. Changes of interpretation can be suggested by other people when new evidence is discovered, when new inferences are offered. Ibsen, H. (1882). Ghosts, and A public enemy. (usual translataion An enemy of the people) In P. Watts (Trans. ), Ibsen, Ghosts and other plays (pp. 101-219). Harmondsworth: Penguin. Kierkegaard, S. (1846). Concluding unscientific postscript (D. F. Swenson & W. Lowrie, Trans.). Princeton, NJ: Princeton University Press (Currrenl work published 1968). Kohler, H. G. (1990). Henrik Ibsen's An Enemy of the People and Eduard Meissner's expulsion from Teplitz. British Medical Journal, 300, 1123-1126. Moi, T. (2006). Henrik Ibsen and the birth of modernism: Art, theater, philosophy. New York: Oxford University Press.